I have such a fun and frugal craft to share with you today. 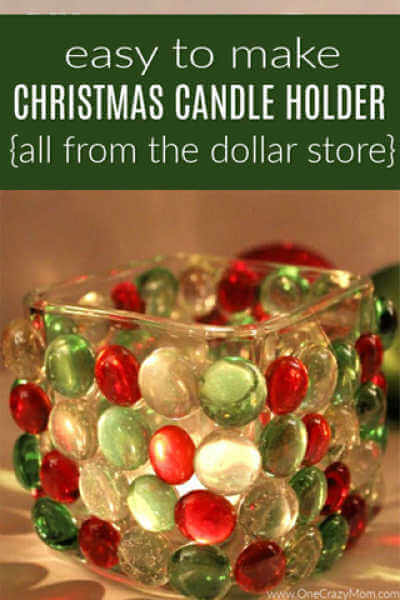 Today I’m showing you how to make this Dollar Store Christmas Candle Holder. I love how it gives off this almost prism like light which will just jazz up your holiday decor. It is so pretty and festive. Candles really can set the tone and make an ordinary day extraordinary! Lighting sets the mood and this idea does it all very frugal. Remember, decorating doesn’t have to cost you a fortune. From our Christmas tree tricks to my gift wrapping ideas to my frugal homemade Christmas ornaments, you know I don’t want to spend a fortune on decorating for Christmas. 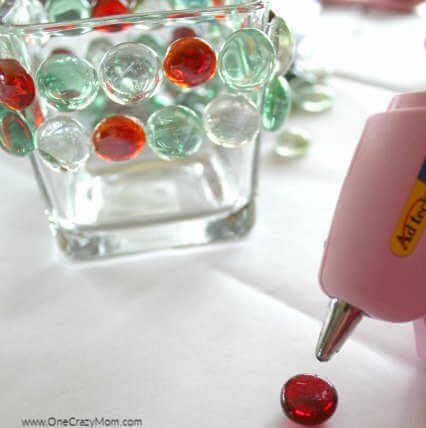 This fun craft is perfect for you to jazz up your decor without spending a ton of money. This is a simple Christmas craft and also makes a great gift idea! Just about everyone I know loves candles. You could make several of these to give as gifts. They are so pretty and sure to be a hit with anyone that receives one of these gorgeous candle holders. DIY Dollar Store Candle holders are perfect for many occasions. These gorgeous candle holders not only are perfect for Christmas but any time of year. Simply use different colors of stones. Clear stones would be gorgeous for weddings, birthdays or anytime you need something special. Spring colors would be so pretty for Easter. It truly is amazing what you can make with these pretty stones. The light of the candle is so pretty glowing thru the different colors. The candle creates such a pretty ambiance for any holiday or special occasion. 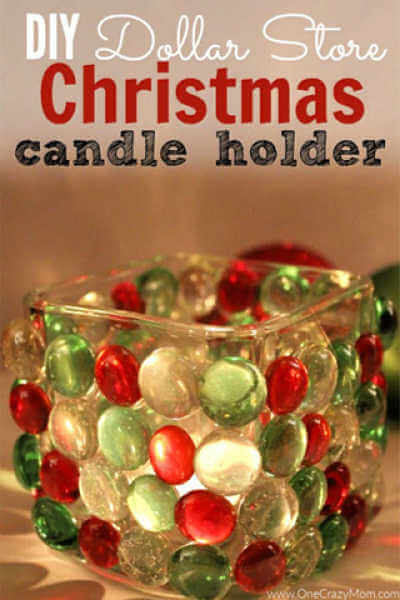 You can do all sorts of pretty combinations for these frugal and budget friendly candle holders. Make your Christmas budget go further with Dollar Tree Christmas decorating ideas. Another fun idea is to use mod podge on these glass containers. 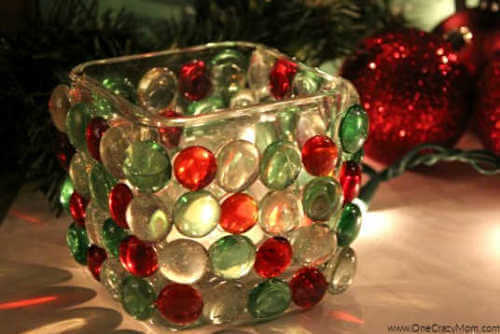 Let’s get started making this DIY Dollar Store Christmas candle holder! 1. 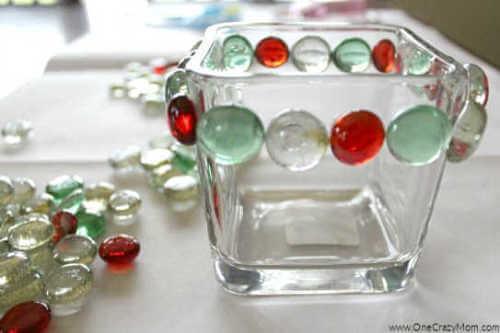 Begin by emptying your glass beads on a flat surface and separating the colors if creating a pattern. 2. 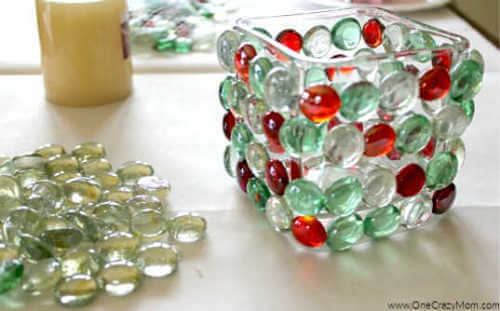 With the hot glue gun glue a row of gems to the top of glass container, all the way around. (They stick in an unbelievably short time, so take your time because if you make a mistake they are almost impossible to get off). 3. Placing them in rows will make sure you have room since the stones may not be all the same size. 4. 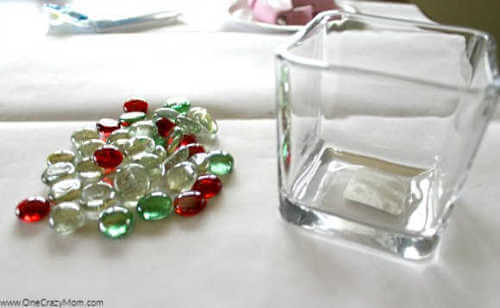 Keep adding rows of stones until you have reached the bottom of glass container. 5. Take a look to be sure no glue gun strings are hanging off and pull off any if you spot them. 5. Add a votive candle & you’re done! No one would ever guess that you made these candle holders from items you bought at a Dollar store! It is the perfect time of year to use Dollar Store Christmas decorations for home decor. Get started with holiday decorating with these DIY Dollar Tree ideas. It is that simple to make Dollar Store Christmas decorations! This is so pretty for Christmas but really, you can do it for any decor. Even all clear ones would be fun. We love crafting and making pretty things to use at home. 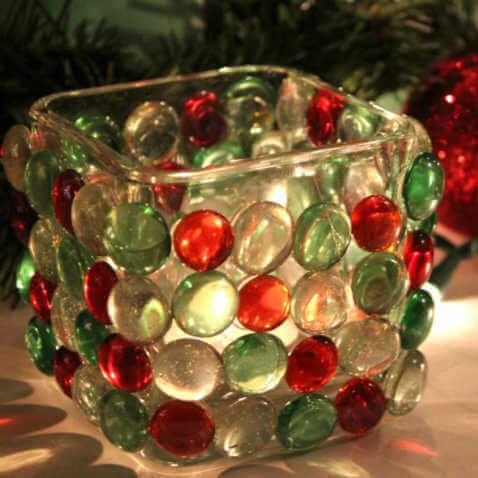 It is a great way to decorate your home on a budget while still creating a festive home. It is amazing what you can create using items from your local dollar store. These would make gorgeous Dollar Tree Christmas table decorations. You could line them up on a table runner down the middle of your Christmas table. This would be so pretty for DIY Christmas Decorations. The possibilities are endless for Dollar Store Christmas crafts ideas. DIY Christmas Gifts Dollar Tree ideas are so fun and frugal. No one will ever guess they are from the dollar store! You can get all sorts of cool things from the Dollar Tree and all while keeping within budget. I am constantly amazed with all my great finds at the Dollar Store. Make sure to learn what to buy at the Dollar Tree Store to save you money. We love to stop by our local dollar store for decor, crafts, birthday decorations and more. It seems every week they have something in new. I love stopping by to see what new finds I can get that week. Anything that can stretch my budget is wonderful and sure to make me stop by frequently. Share with us any great Dollar Tree finds you have scored. Let’s get started decorating today with these fun ideas! Wow amazing its not only pretty but very creative. Very festive…I love anything with candles. Can’t wait to try this…love it.